Because the street life (and even the underground) is so riveting in Paris, it is easy to keep ones feet, and eyes, firmly on the ground. 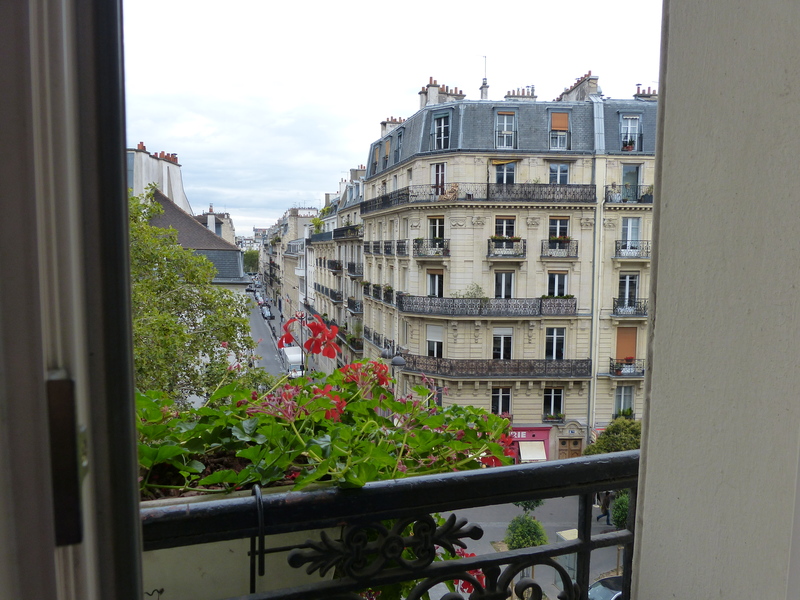 But during my sojourn to Paris in September, while staying in my old stomping grounds of the Latin Quarter, I raised my sights, and was amazed by what the rooftops and skyline revealed. Not only beauty and grace, but their own historical testimony, embedded in architecture, form, tiles, sculpture and stone. Although Roman history in Paris is very visible in the Latin Quarter, its great monuments–the arena named for the Roman city, Lutece, and the baths beneath the National Museum of the Middle Ages– at this point in time, do not soar, but are deeply rooted in the ground. 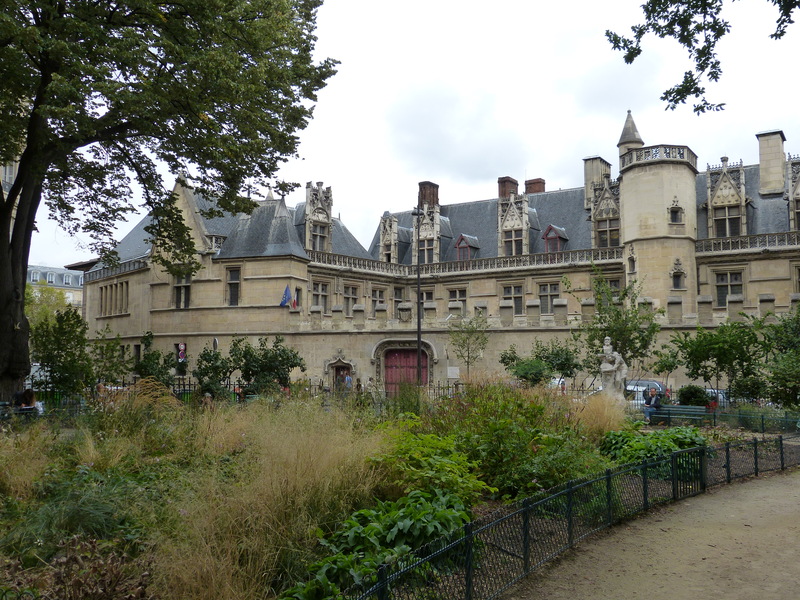 But the Middle Ages definitely claims a place in these Left Bank skies, notably at that same museum, also known as Cluny, once the home of a vast abbey, and now a monument to the spires and spiraling lines of late medieval gothic. Although the venerable Sorbonne, which is right across the street from the Cluny, was also a medieval institution, beginning in the early 13th century when one Robert de Sorbon was hired as a tutor for eight theology students, the present building reflects the classical elegance and sense of reasonable proportion that marked the 17th and 18th centuries, with later, less appealing add-ons. But the dome and main entrance behind the plaza would be hard to improve upon. 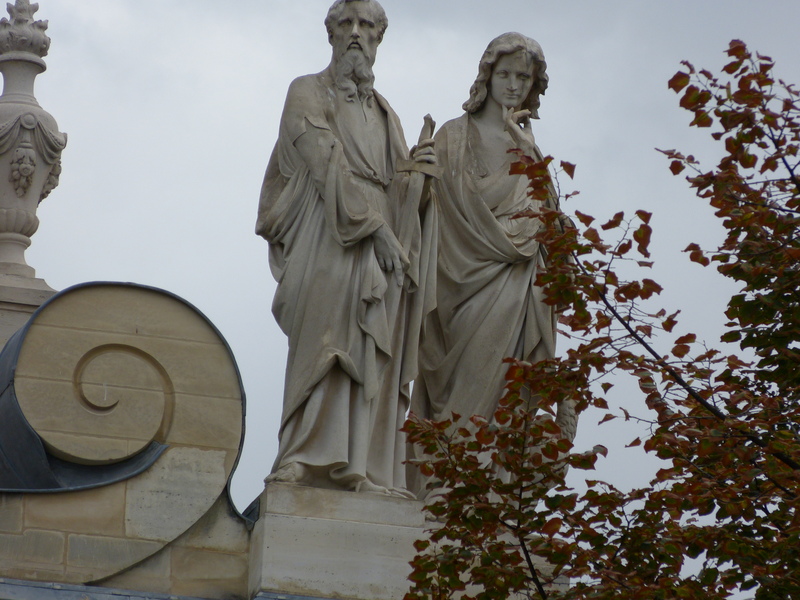 And when I was a student there, I often wondered what star-crossed pair this was, on the rooftop to the right of the dome, keeping in mind that this was the place where Abelard met the lovely Heloise. 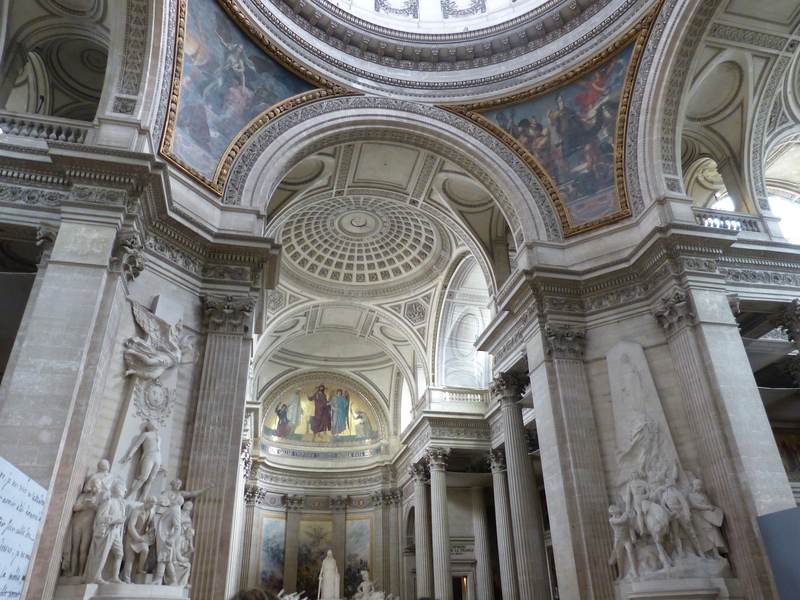 Another look at the resurgence of classical lines is evident in the Pantheon, that temple to the Revolution. Inside are homages to the leaders of the Revolution: Diderot, Rousseau, Voltaire and many others. Voltaire and Rousseau, bitter enemies in life, and combatants to the end, were, in a final irony, buried opposite each other in the crypt. But like most buildings in this neighborhood, the Pantheon’s roots go far back. Homage is also given to Saint Genevieve, the patron saint of Paris, in a mural series by Symbolist painter Puvis de Chavannes. In them, he celebrates her life and her heroic acts in the 5th century, including leading the Parisians to stand up to the threat of an invading Attila the Hun. 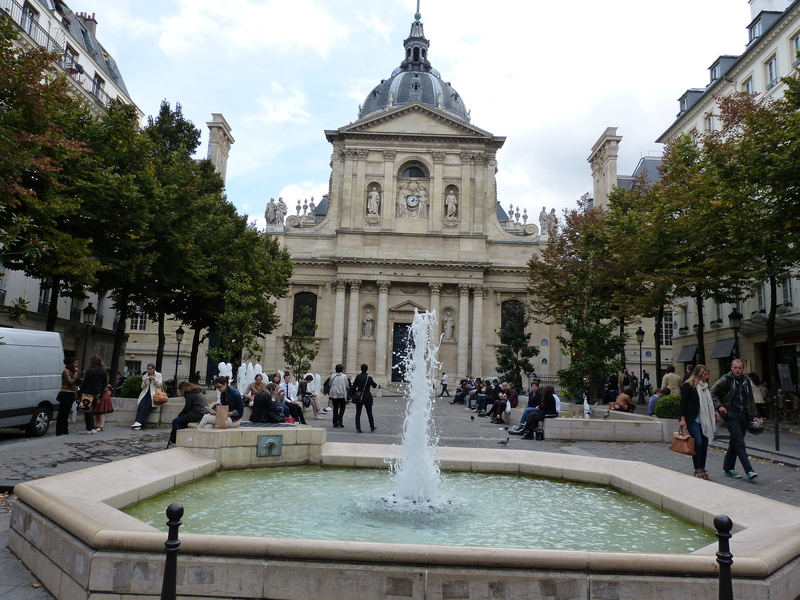 Later a large abbey was established on the top of Montagne St.-Genevieve, (where the Pantheon now sits) in her honor. After several centuries, however, the abbey was in disrepair and, at the time, King Louis XIII became quite ill. He promised to build a grand new church to glorify her if God granted him health. God did, and construction began reflecting the classical tastes of the 17th century. But, as often happens with building projects, there were delays and the church wasn’t actually finished until 1789–the year that marked the beginning of the Revolution, and not an auspicious one for churches. The glorious edifice became a secular palace to glorify the new era and its heroes, not the saints of the past. Although the 19th century urban developer, Baron Haussmann, known for knocking down old buildings, widening streets and creating majestic boulevards, largely left the twisting, ancient streets of the Latin Quarter alone, sometimes, along its periphery one can imagine seeing traces of his handiwork. Stately buildings with modified “Mansard” roofs symbolize the Paris of the Industrial Age and the first part of the 20th century. 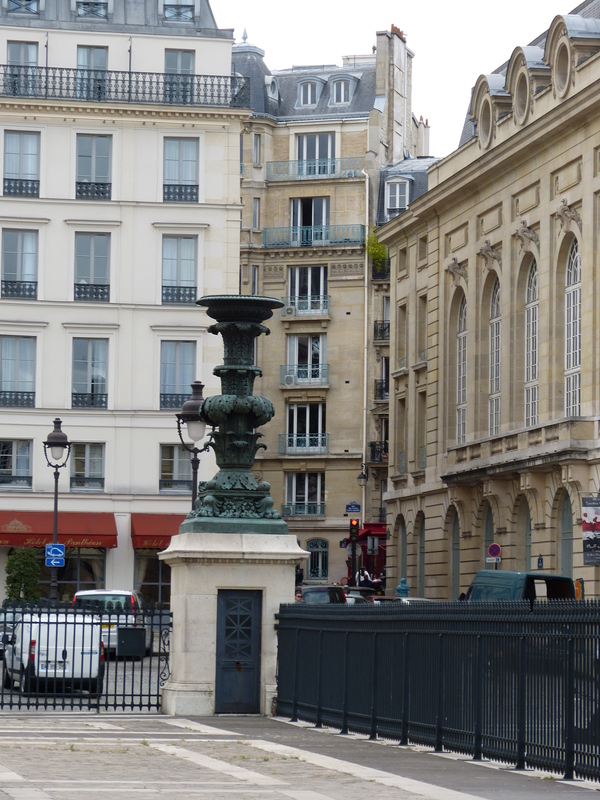 A look that could be called “Haussmann” could certainly be seen on the most recent street where I lived, in a hotel, on the rue des Ecoles. Skyline flower boxes give its charms the finishing touch.